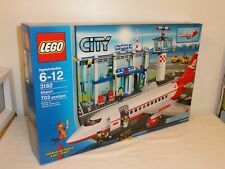 Lego City 7894 Airport Huge Big Pane Rare Minifigs Manual 100% Set. Changed support solid beams to hollow triangle beams. It is new and factory sealed. For Ages 6-12. Contains 703 pieces. Lego City - Airport - # 3182. There's so much to do at the Lego City Airport (3182). 703 Pieces. This is a gently used in the box Lego City - Airport. Passengers may now board This set captures all the imaginative fun of a bustling airport without any of the hassle. This is a NEW Lego City Airport, Retired Set #3182. They have been carefully handled for sorting and storage purposes only. There’s so much to do at the LEGO® City Airport! Looking for a special Lego piece?. ONLY the aircraft and original instruction manual number 2. Everyones on the go at the big LEGO City Airport. Contains 703 LEGO pieces. We cannot make any change. Pieces: 703Everyones on the go at the big LEGO City Airport!Theres so much to do at the LEGO City Airport! Everyones on the go at the big LEGO City Airport. Contains 703 LEGO pieces.